Being a massive foodie, I naturally tend to gravitate towards anything involving food. A few years ago, I decided to make a change in my life, to live a healthier and more active lifestyle. Apart from gaining an appreciation for food I already loved on a whole new level, I've livened up my diet by introducing a variety of healthy, wholesome, exotic, and tasty food choices; and I've also lost 20kgs and have managed to keep it off for two years now. I love to pack each meal with as many different flavour combinations and nutrients as possible, so each mouthful nourishes my body with the essentials needed for it to function properly. 1. Make sure you thoroughly rinse the quinoa of its bitter coating, using a fine seive under running water. When the water starts to run a clear colour again, place the quinoa in a pan on high and cook until it beings to smell nutty. Then add about a cup of cold water into the pan, cover, and reduce the heat slightly, allowing the quinoa to simmer and absorb as much water as possible. 2. While the quinoa is cooking, grab you handful of lettuce and place in a bowl. Drain the can of salmon, and then add it to the salad. 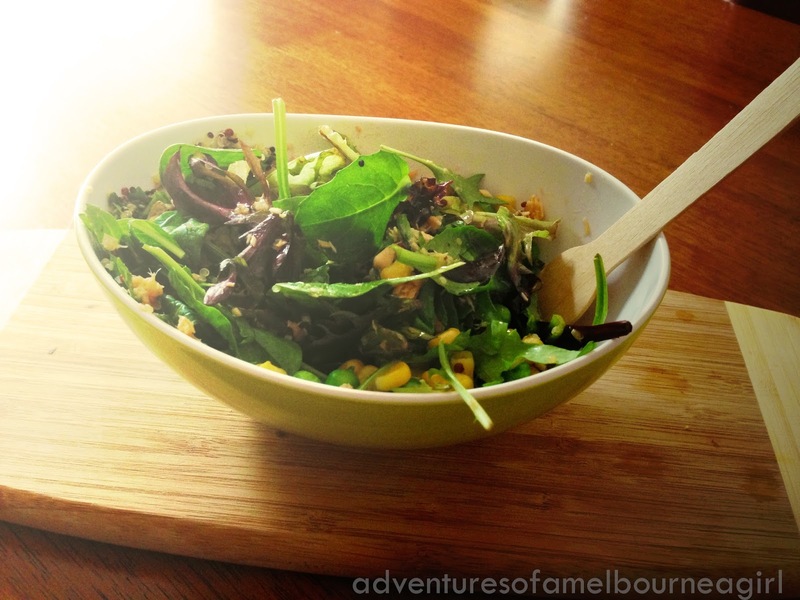 Cover your cup of frozen peas and corn, and cook in the microwave for about 1.30 mins, and then add to salad. 3. Hopefully by now the quinoa will be cooked, and you can also add it to your salad. Mix all the ingredients together, and season with some extra virgin olive oil and lemon juice if you wish!